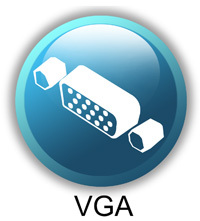 The common 15-pin VGA connector found on most video cards, computer monitors, high definition televisions which support VGA connections, and other devices, is almost universally called "HD-15". HD stands for "high-density", which distinguishes it from connectors having the same form factor but only 2 rows of pins. However, this connector is often incorrectly referred to as a DB-15 or HDB-15. 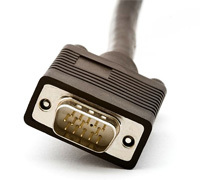 "VGA connectors" and their associated cabling are always used solely to carry analog component RGBHV (red - green - blue - horizontal sync - vertical sync) video signals along with DDC2 digital clock and data.